The rose diagram has bins that go from 0 to 360. If you need to create a bin that goes across the 0 degree line, a work-around will need to be used. For example, suppose you want to create a bin that goes from -15° to +15°. All values between -15° (345°) and 0° will be replaced with a 0°. A new column is created with the transformed data. Select the data file and click Open. The data will open in the Grapher worksheet. 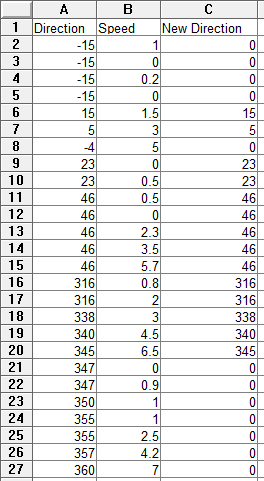 Original data displayed in worksheet. 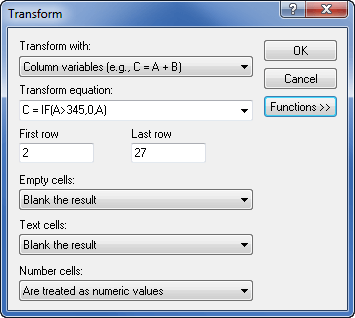 For the Transform equation, type C=IF(A>345,0,A). This assumes that the direction column is column A and the new blank column is column C. Replace the C and A with the appropriate columns for your data. Enter the equation to transform all values greater than 345 to 0. Click OK. All values greater than 345 are replaced with 0. Enter the equation to transform all values less than 0 to 0. Click OK. All values less than 0 are replaced with 0. Altered data displayed in the worksheet. Click the File | Save command to save the file. Click the File | Close command to close the file and return to the Grapher plot window. Back in the Grapher plot window, create a new rose plot. Click the Home | New Graph | Polar | Polar Rose Chart command. Select the data file edited above and click Open. Click on the plot in the Object Manager to select it. Set the Direction column or Data column to the transformed column above, Column C.
Set the Bar width bins type field to Custom bins. Click the Edit button next to Bins. Set the first bin to have a Minimum (>): value of -15. Adjust any other bin values and click OK. The first bin will cross the zero line, displaying the desired data.